Installed hard disk explorer on Windows 10, 8, 7, Vista, XP, etc. 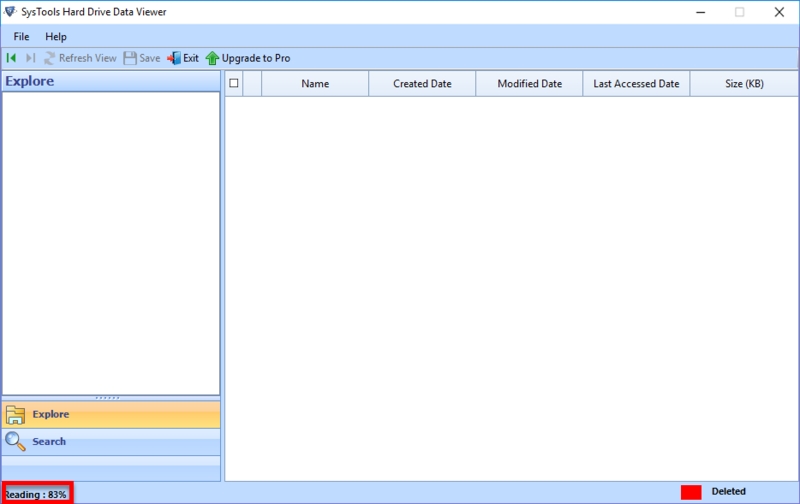 The HDD explorer software freely extracts data from system hard drives and mount it on the pane. It will be extracting all items like audio files, video, power point files, etc., from the chosen disk. The opener will be listing items in alphabetic order with their original name. Hard drive reader for PC provides an automatic approach to read items from a formatted hard disk. It will be extracting data only from NTFS formatted drives. When the data extraction procedure gets finished, it will instantly load all the encountered data on preview pane. Freeware is having capability of retrieving back to shift deleted or permanently erased items, which are unable to retrieve from Recycle bin also. The recovered deleted items gets listed in the software with red color on the preview wizard of the hard drive explorer software. 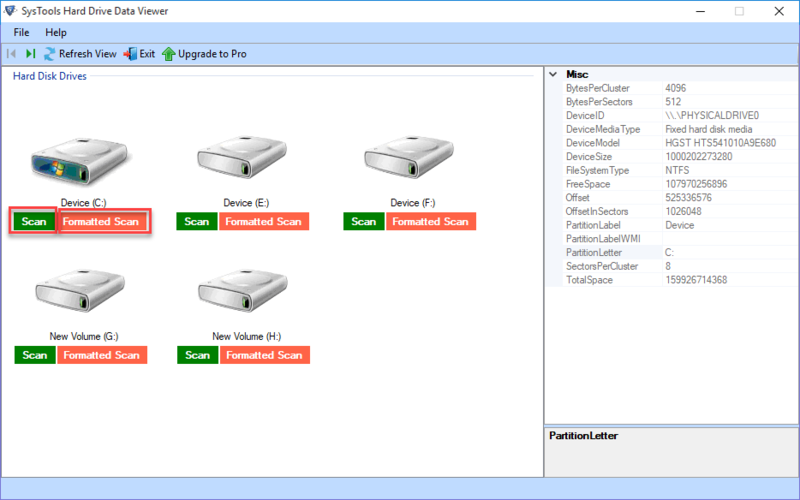 Free GPT partition reader is having capability of detecting all system partitions. Just after the launching time, it will display all hard disks, which are appended in the machine. No matter what is the size hard disk, it will be working smoothly with all sizes. 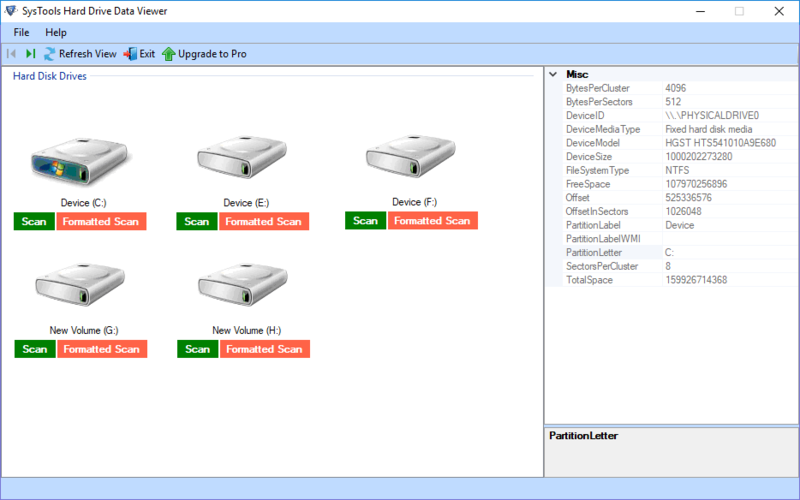 The hard disk explorer freeware not only explores the internal hard drives of a machine but, also works with external storage devices. It also extracts files and folders from pen drive, SD card, external hard disk, and all other components that are connected through UBS in the system. Hard drive data explorer software enables users to view GPT / MBR partition on Windows 10, 8.1, 8, 7, XP, Vista, etc. When an individual faces trouble while opening Windows partition, they can utilize this free product in order to fix these kind of issues. Does your free hard drive data explorer software provides any data saving feature while working? No, the hard drive file viewer tool is brilliantly designed to open and view hard drive on Windows OS. By a mistake, I have clicked on wrong drive in your Hard disk data opener. However, it had start scanning file. Is there any procedure to stop this ongoing scanning procedure? Yes, move your mouse cursor on very left-hand side of the software screen. Here, click on Stop button and then, a warning message dialog box appears. Click on Yes, if you are sure that you want to stop the procedure. 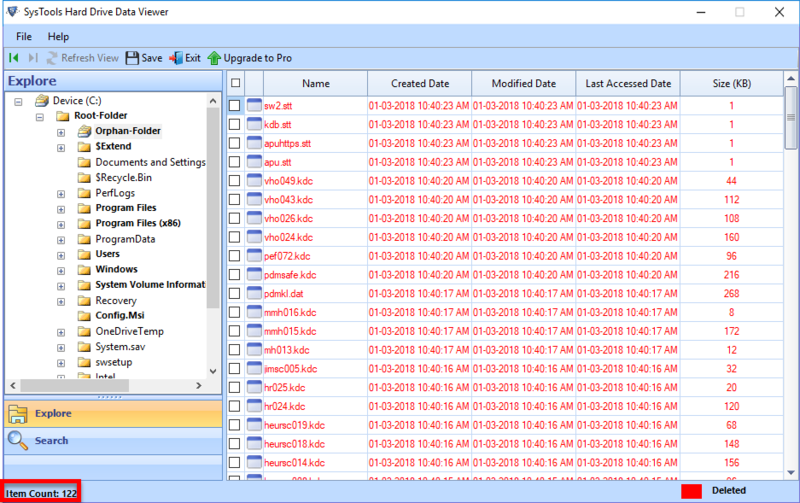 Is your hard disk data explorer software workable upon Windows 8.1 OS? Yes, the HDD Viewer application is a free Windows-based utility, which is easily compatible on all versions of Windows. I am having a hard drive of 3.5TB. Will your reader work with this size of disk? Yes, no matter what is the size of the system hard disk. The free product will be working flawlessly with any size of the external or internal hard drive. The freeware thoroughly starts scanning the chosen hard drive and extracts files from it. Now all the data will be loaded on viewing panel of the opener. You just need to click on particular folder whose files are required by you for viewing purpose. "I was provided with a task to open and view data from NTFS formatted hard disk on Windows 10. But, when I tried to perform this activity manually, NTFS partition was showing an error statement. The line was stating that my file is inaccessible and cannot be opened. Oh my god, literally a nightmare moment! But, meanwhile one of my friend recommended me to use hard drive data viewer and I took his words. The application is a bundle of surprises, which offers many astonishing features within it." "I work in a forensic firm and it is my one or the other day duty to analyze a file or a hard drive on my machine. However, due to bad luck or you can say the occurrence of shortcomings it became a hassled procedure for me. Thankfully, I got this Hard drive data explorer software, which made it an easy task to open hard disks data on Win 8. I am completely satisfied with this free tool"